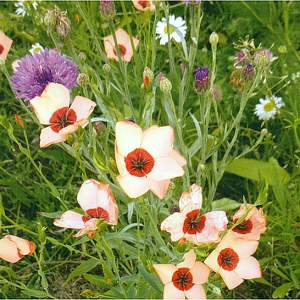 A popular wild flower seed mixture which recreates the traditional wild flowers that used to thrive in cornfields. 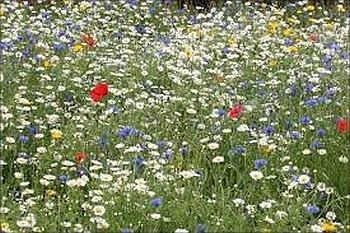 Create a wild flower area in your garden by sowing native UK grown and produced wild flower seeds. 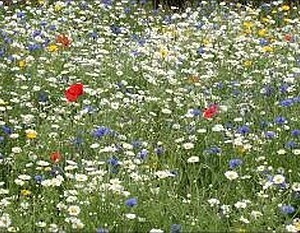 There is no grass in this seed mixture just 100% wild flower seed. This will create an attractive flowering area which is quite easy to look after and by encouraging bees and other pollinating insects benefits the environment. 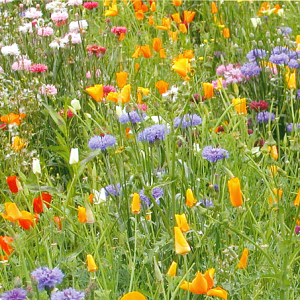 The wild flower seed mixture is ideal for most soils that are of moderate to low fertility. March to April and August to September. The recommended sowing rate is 2gms /sq metre. The plants should start flowering from around mid June, depending on growing conditions such as warmth and moisture and date of planting. Flowering should continue until about August/September. 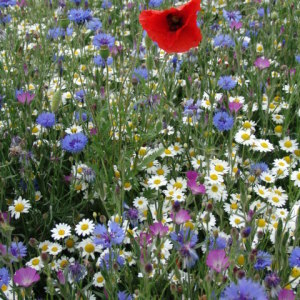 The wild flower mixture gives a good cover, can be seen from a distance and is attractive to Bees and other insect pollinators in the natural environment. At the end of the summer, when flowering has finished, ensure that all seed is shaken from the mature plants as you pull them up. Remove unwanted plants and any perennial weeds from the area before raking it level in order to provide conditions suitable for germination. Disturbing the soil is required to encourage germination of most annual species. Most species will germinate and establish within a few weeks, although some may not appear until the following spring. Some thinning out may be necessary. New seed may need to be sown into the area for the first 2 or 3 years to build up a really sound plant population. Contact us for a price for larger quantities.